This week’s automotive awesomeness involves an amazing new Mazda, a one-sided argument, all the goodies and in Part 2 seeing a way round, mixing your own, a little piquancy and a lot more to digest with your breakfast. I currently drive a 2010 Mazda 6 2.2d (163) TS, averaging just over 10,000 miles per year, mainly by weekly commuting in and out of London and long drives to visit family. I will continue with this for another year before I retire from the Armed Forces. Thereafter, a car will be used for leisure and visiting family/friends. The Mazda 6 has been excellent from a reliability perspective and is comfortable and a joy to drive. I also love the fact that I can sling my bicycle into the boot easily. I'm looking to change in April/May, due to the car's age. However, I am not so keen on the current Mazda 6 design. And, I'm thinking of downsizing (my three kids have more or less flown the nest). Current replacement favourite is a Mazda 3 2.0l Petrol (165ps), due to how good my current Mazda has been and the boot is big enough for a cycle. And, I like to look of the Volvo V40. I would value your thoughts (on the Mazda and Volvo) and any other suggestions, please? The Mazda 3 is a much more satisfying car to drive than the Volvo V40, but the 165 is a bit low geared and the all new 2019 Mazda 3 is due to start arriving in the UK in May. I highly recommend the 2.0 Skyactiv G Mild Hybrid, from £20,595 including satnav and many other driver aids. 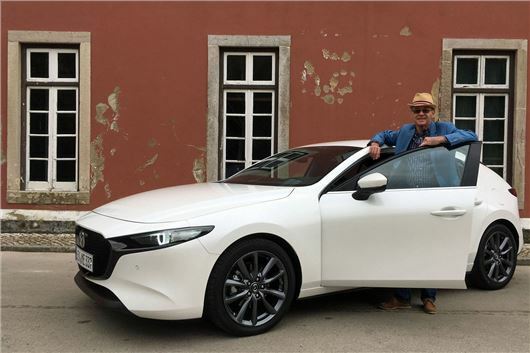 /road-tests/mazda/mazda-3-2019-road-test/ It puts the V40 out of the picture. I have owned a VW Golf 1.4TSI 150 automatic from new in March 2016. It has developed an intermittent fault where there is sometimes a noise when changing up in the odd number gears. It doesn't noticeably affect performance and seems to happen when the engine is warm and travelling in stop/start traffic. The best description I can give is a slipping/grating sound though, as I said earlier, I can't detect any effect on the car's performance or smoothness of the gear change. I reported this to the dealership at the last service, but all they said was that they couldn't duplicate the fault and were unable to assist other than suggest that I call back to see them next time it happens. It has continued but not when I have been near their location. Is this a common complaint amongst the reports of problems that you regularly receive relating to this gearbox and do you have any thoughts on the likely cause and/or recommendation on what I should ask VW to do about it? Which small plug-in automatic petrol hybrids come with cruise control, automatic braking, front and rear cameras and automatic parking options (i.e. basic essentials for a modern car). This is the smallest, but it's not plug-in: /road-tests/toyota/toyota-yaris-2017-range-road-test/?section=prices / This is the smallest also available as a plug-in: /road-tests/kia/kia-niro-2016-road-test/?section=prices / And this is the spec of the Niro EV: /road-tests/kia/kia-e-niro-2019-road-test/?section=prices / You can also get a Hyundai Ioniq hybrid, plug-in or EV and a Hyundai Kona EV: /road-tests/hyundai/hyundai-kona-electric-64kwh-2018-road-test/ A lot of the stuff you mention, such as automatic braking, doesn't always work and self-parking is more trouble than it's worth. I am losing coolant from my 2012 VW Passat 2.0TDI estate. Over about two months it goes from maximum to minimum. There are no obvious leaks, the system has been pressure tested, no issues with the engine, which always starts perfectly and no smell inside from the heater. I’m at a loss as to what it could be. Grateful for any ideas. My son has a 2013 Ford Kuga. He wants to have installed a front seat passenger airbag isolation switch so he can safely fit a child’s seat for his daughter. The other children are using the back seat. He’s been quoted by his Ford dealer just under £300 to have this work done - and he’s been told that he’ll have to sign a disclaimer before the work is undertaken. He’s also contacted Airbagman for a quote and is waiting for that. Is signing a disclaimer normal practice? As this is effectively a modification (albeit an approved Ford modification) does he have to notify his insurers? Very much so. The garage needs the disclaimer to avoid liability garage for interfering with the specification of the car. Best to get written approval of your insurer for the modification before you go ahead. They might not give it because they cannot absolve themselves from passenger liability if you fail to set the airbag when an adult is in the passenger seat. Surely, the only problem anyway is with a rear-facing baby seat. The airbag is more likely to save the life of a child in a forward-facing child seat than it is to injure her. When I bought my Mercedes CLK240 new in 2004, the owner’s manual advised that the ATF in the transmission 722.6 would never need changing. However, on 18-02-2003 Mercedes issued a Service Information document SI00.20-p-0022A. This advised owners with transmissions 722.6/9 and VIN numbers later than mine to ignore this information in their owner’s manual, and the following words were used. “In the future, the automatic transmission fluid in automatic transmissions 722.6/9 is to be changed once after 60,000km.” There is no reference to the filter or to subsequent distances. I have now done over 60k miles without an ATF change, and several times I have tried to book this service at my local MB dealership. When my VIN is entered into their computer, the service advisor tells me that the ATF change is not recommended. Can ATF really last forever? What should I do? Find a member of http://www.fedauto.co.uk who has a Liqui Moly Geartronic automatic transmission transfusion machine and get it changed at the correct temperature and pressure. In August I bought a 2015 Mazda 2 1.5 Skyactiv G 115 manual, which has now done 20,000 miles. I was getting 'clutch judder' when starting off when cold. I thought hey-ho, there goes the clutch and monitored it. As it happens, a couple of weeks ago I started to use Shell V-Power (99RON) just to see if it made any difference to how the car ran as an experiment following the words in your section. The fuel filler cap says use 95RON but the user manual says you can use basic and super. Since using the Shell V-power the clutch judder has disappeared and the car runs a lot smoother with a more flexible top gear. So 'clutch judder' could well have actually been engine hesitation through the type of fuel used? By the way I agree with you about Mazdas. Very under-rated. It's a lovely car. I currently have an old shape MINI Clubman and three black Labradors. I put the middle seats down and have a guard across the back of the two front seats. The interior is quite well protected with bespoke plastic covers from the Hatchbag Company. However, the dogs have too much room and are basically illegally unrestrained. With deep regret, I need to change my car, but what to is my question? Happy to look at new and second-hand options. Need something not too high off the ground (one dog is 14). I don’t, on the whole, travel very far and could really do with having seating for 4/5 again. Any suggestions to look at would be very welcome, and quite honestly, I’m looking forward to getting a more comfortable ride than my MINI. You didn't think of caging them? That is the most obvious and safest solution to this problem, least likely to cause injury to the animals or the people in the car in the event of a fairly severe collision. A new model Citroen Berlingo or Peugeot Rifter (available in two body-lengths) would give you the low load height and the versatility you seek: /road-tests/peugeot/peugeot-rifter-2018-road-test/ Smaller, maybe a Ford Tourneo Courier, but that doesn't have a very good rear seat folding arrangement. I found a Pirelli Cinturato P7 all-weather runflats on “mytyres.co.uk”, but nothing else and not in the correct size. I’m also looking at an Outlander PHEV but there is nowhere for a spare, though the boot is bigger so maybe I could fit an ‘emergency’ wheel. Also checking through other PHEVs due 2019 so any comments very welcome. I have always had a sports car for myself and a small 5-seater car for transporting my children and now grandchildren. Finding that the Nissan Micra is no longer a small car, I wandered into the next-door Suzuki dealership and bought a new Celario. I was pleased that the 1,000 cc engine functions surprisingly well, but am very dissatisfied with the automatic gearbox. Often after stopping in traffic, in gear, the car will roll backwards when I take my foot off the brake. When I took the car back and complained I was told “they all do that”. Also, three times when I have put the gear lever into ‘Drive’ nothing has happened until I put it back into neutral and repeated the manoeuvre. Of course they said they had driven the car and not experienced this. What should I do? It's not an automatic. It's an automated manual. That's the cheap solution to putting a two-pedal transmission into a low-priced car. It rolls backwards because it has no torque converter, just a conventional clutch. You stop it doing that by left foot braking. Some weeks ago your (always interesting and useful) column included an item about changing the cambelt on a VW Golf 1.4TSi at the recommended time and included a comment along the lines of "and there are plenty of other things to go wrong". My nephew has just phoned me to say he has water problems in his 5-year old, 60k mile 1.4TSi, dealer maintained. The cambelt and water pump were changed in the last year. Recently, the fan was running much more than normal so he booked a check. The garage says they have found a "sandy substance" in the coolant which they cannot identify. They are saying he should have a three-day flush of the system (at £900) in the hope of cleaning it out. This raises queries in my mind. Is the heater matrix or something else disintegrating? What did they put in the coolant when they filled the system previously, and so on. Is this a common with this engine (the dealer is implying not). They say that if this does not cure it, the engine will be a write-off and VW "may" give some goodwill against a new one but not usually at that age. He has said they should time any such goodwill to the time of the cambelt change. I have suggested he speak to VW direct. As I drive a 2017 Touran 1.4TSi (currently 14,700 miles over 21 months) your thoughts would be appreciated by both of us and I wonder if you could also elaborate on the other things that could go wrong with this engine around and beyond 50 – 60k miles as alluded to in your previous answer. Is there a sensible age or mileage when I should think of changing mine? I had never heard of this before in the 120 complaints about the Golf Mk VII: /carbycar/volkswagen/golf-vii-2013/good/ and the 220 about the Mk VI: /carbycar/volkswagen/golf-vi-2009/good/ It later transpired that the thermostat had stuck, so the coolant was not circulating properly and the blades of the waterpump impeller had disintegrated, becoming the “sandy substance” in the coolant. Our son and family (wife, plus two daughters 7 and 5 years old) are to return from New Zealand to the UK. They currently run a ten-year old Pajero in New Zealand. Can you recommend the equivalent they should look for in the UK. My 2014 BMW F11 535d Touring is going extremely well, but its tyres are not. The car came on 19-inch wheels and 245/40/19 98Y Continental Excellence tyres and it has VDC which spends most of its time set at Comfort Plus. Now the general comfort is excellent and the tyres - when they last - have covered as much as 27,000 miles, probably the best results of any tyres over my 55-year driving life. So far, no complaints, but I’ve had to replace nearly-new tyres five times in the last year due to pothole damage. (I now insure the new tyres with Kwik Fit for £18.99 which is what it costs to replace them rather than £190+.) The obvious answer is to go for 17-inch or 18-inch rims but I don’t want that expense, so can you recommend an ordinary non-run-flat replacement for all year driving? I do about 10K miles a year. It's the profile of the tyres that is killing them on potholes, not the fact that they are runflats. So the only option is to switch to smaller wheels with deeper profile tyres and on a powerful 535d with 700Nm torque it's not a great idea to go too small. 18-inch might make enough difference with something like Michelin Pilot Sport or Pirelli P-Zero tyres, but you will need to get clearance from your insurer before making the change. I have an ancient Honda CR-V, which is worth very little. I am looking to replace it with a used automatic car that affords me a slide-in driving position, preferably four-wheel-drive, and in either hatch or estate form. My annual mileage is low and I’m looking for comfort, reliability and good looks. My budget is around £13,000. I know very little about cars, so your advice would be much appreciated. I rather like the look of the MINI Countryman, but a car mechanic friend of mine told me they are problematic. Are they? Get a later, post 2012 CR-V 2.0iVTEC 5-speed torque converter auto. They are a bit slow and the transmission is prone to hunt between gears, but on 17-inch or 18-inch tyres (NOT 19-inch) they are very comfortable. £13,000 buys a 2013: /used-prices/Honda/CR-V/2013/ More about them here: /carbycar/honda/cr-v-2012/ A MINI Countryman offers easy ingress and egress and is smaller, but not necessarily as reliable. I play golf and find that all modern cars have boot space too narrow to fit a set of clubs sideways. Any suggestions ? My ancient Rover 75 saloon can carry 2 sets of clubs and 2 small trolleys. Mazda 6 ? I have covered 91,000 trouble-free miles in my Audi Q5, apart from emissions issues that have cost me £2,100 to date. Audi paid for an EGR valve and manifold. If I keep it, what expenses would I expect? We do 12,000 miles a year, mostly short runs, but some 200-mile journeys to our family in Hampshire + touring caravanning anywhere the UK. If we can afford it, I would like to buy a nearby new hybrid SUV. We need a good roof to door sill height for the front doors. This is why we bought an Audi as opposed to a Volvo XC60. I thought that I might look at a Toyota, as they have years of experience in hybrid technology (our daughter is driving her third Prius), but the RAV-4 has a very small opening for the front doors. The Honda can tow about 0.75 of a tonne, which is useless. Can you advise on KIA, etc. The EGR problem may have been self-inflicted by the car's regime of "mostly short runs". But there is a bit of a problem in switching to a petrol PHEV or hybrid if you want to tow, Maybe a Mitsubishi Outlander PHEV: /road-tests/mitsubishi/mitsubishi-outlander-phev-2019-road-test/ That is rated to pull 1,500kg. The more expensive Volvo XC90 T8 can haul 2,400kg. But, as you write, the new Honda CR-V self-charging hybrid can only tug 750kg. We have been driving Mercedes for 30+ years. We currently have an E350CDI Bluetec that is 5 years old with 32,000 miles. We are in the London area and would like to change to a petrol vehicle. My wife likes Jaguar saloons, but what would you recommend? My wife bought a 2012 Toyota Yaris 1.3 Hatchback in July 2016. In April 2017, she received a recall letter to modify the drivers airbag inflator “to prevent it deploying abnormally”. The letter gave details regarding contacting the nearest official Toyota centre which she did immediately. She was informed that parts would be ordered and arrangements made to rectify the fault. When she had not been contacted by August 2017 she asked about it and was told that there was a delay in providing the necessary parts and they would make contact when they were available. She phoned again in June 2018 and was given the same information. She still has not been contacted. This is obviously unacceptable but what are our options? This recall affected something like 100,000,000 airbags worldwide and put the airbag supplier into receivership. So the only way replacement parts could be made was for alternative suppliers to be set up in new factories to manufacture them. Tall order. That's why it's taking some time. Further to your response regarding whether a larger oil cooler was recommended for towing with a Volvo XC60 T5 Auto 2017. I called my local Volvo dealer, from whom I purchased the car and asked for cost etc. They were not keen to supply or fit a different oil cooler, which I had suggested I might request at the next service in May. All can tell you is that this is contrary to what we were informed at the launch of the original Volvo XC90 when the manufacturer was questioned about their towing ability. We were told that the transmission oil cooler is modular and can be expanded with additional modules. Uninhibited response - so the dealer wanted 900 quid to flush the coolant system and if that 'didnt work' say the engine was a write off when in fact, it was a stuck thermostat and impellor blades disintegrating! Remind me never to buy a VW. Not a fan of white cars but that new Mazda 3 does look the business in white. Just a pity the engines have been neutered in order to keep the emissions and mpg (under the new testing regime) at decent levels. New Mazda3 2 ltr petrol: 0-60 in 10.4 sec, previous gen car (same engine but without the small hybrid bit) in 8.9 sec. Oddly enough, the auto version is a lot closer in performance (10.9 sec vs 10.3 sec), though still slower in the new one. It looks great, but I have my doubts that the carryover petrol engine will attract customers, the diesel is essentially a direct replacement for the previous 1.5TD and is vastly slower than the 2.2TD, and by all accounts, the all-new 2.0 SCCI engine, whilst hopefully being all it is touted (diesel mpg and petrol responsiveness/lower weight) to be, cars with that engine (it'll only be 185PS - no GTI) will supposedly be costing a whopping £27k+ list price - that's BMW money. Not automatically - it doesn't need left foot braking, just the use of a cunning device called a handbrake :-) a much more sensible solution, as then the brake lights won't be on to blind the following driver at night. I think you’ve linked to this as the 30th March part 1 section, part 2 seems correct. Can you update the URL please.